The Moroccan herpetofauna presents some conservation problems similar to those that may occur in other regions and countries of similar characteristics, although in this case there are any more particularly related to the collect of specimens especially for entertainment, but also for other purposes. 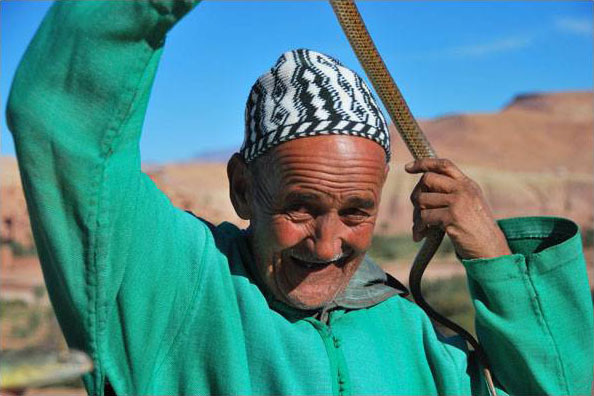 Aïssaoua people are known as snake hunters in Morocco. Some have in them their most important source of income, others are casual hunters who develop this activity in a year period, or when presented with the occasion, but not economically maintain with it. Although this activity focuses mainly on catching snakes, they occasionally collect other animals such as Dobs (Uromastyx nigriventris), Spur-thighed Tortoises (Testudo graeca) and Chameleons (Chamaeleo chamaeleon), if they have the opportunity to sell them, either for traditional medicine, food or as souvenirs for tourists. By capturing reptiles in ecosystems in which they are usually larger vertebrates, the aïssaoua may cause great imbalances by removing the predators that are at the highest rung of the food chain. These regulate the abundance of small mammal populations in areas where the poor agriculture is practiced in them is highly vulnerable to fluctuations. They are precisely the greatest hunter of small mammals, the species most hunted and collected by aïssaoua: Puff Adders (Bitis arietans arietans), Egyptian Cobras (Naja haje) and Western Montpellier snakes (Malpolon monspessulanus saharatlanticus). It has been estimated by indirect data that can be collected through 4,025 to 9,545 snakes of these and other species of snakes. The damage doesn´t finish just here. In addition to ecological, most captured species have a high biogeographical value, being either endemic taxa, either species of tropical origin and in the area have some interesting and relict populations dwindling. These are the last representatives of the fauna that occupied the area in previous periods of different weather. The aïssaoua are extremely effective, and their activity is not devoid of ethnographic value. They usually hunt alone or in pairs. The search method is based on walking through areas where abound the burrows of the obese rat (Psammomys obesus) or Moorish squirrel (Atlantoxeros getulus), preferably loose substrate, which is well marked traces of snakes. These areas often coincide with ecotones earthy dune areas, edges or clumps of sediment wadis, along roadsides and highways, where the substrate is removed and taken over by rodents, etc. When they locate a new track to and around a burrow, carefully review the area to make sure the snake is into a hole and hasn´t given out by the same or another hole. Often help of a mirror, reflecting the sunlight to illuminate the interior of the holes. Some Aissaoua distingue tracks in Naja / Daboia, Malpolon / colubrids, Bitis, Cerastes. Although it varies depending on the ability of Aissaoui, some are very effective in their catch, and when digging a burrow is rare if the snake isn´t inside. Obviously, the larger and bigger individuals are the most hunted and most easily detected, leaving patent tracks. They are usually known in the area where they search, and when someone see a snake they tell to the Aissaoui to locate the snake. Sometimes even put a cloth with stones at the entrance to a burrow where they have seen go into a snake and expect to come the Aissaoui (testimony of local people). Snakes are captured by own rituals, to cater to the charmers in tourist areas, and some collectors have an identification as to the Pasteur Institute. Sometimes they themselves show the snakes as entertainment for tourists, becoming a hunter and charming. However, in most cases sell snakes, so try to keep them in top condition, without extracting inoculants poison teeth and getting extra money in the sale. The aïssaoua say that when a pregnant female is captured they release it, although, whereas the growing scarcity of specimens, we doubt that this happens. In a meeting with an Aissaoui, which captured a subadult Puff Adder, not big enough to interest the charming, the specimen was collected, however, the Aissaoui explained that they take home and feed them until they get large enough to sell. Few snakes should be truly released. A sequence of the capture of a specimen of Naja haje by a Aissaoui: 1. Location of tracks. 2. Begin to digging. 3. Use a mirror to find the snake in the huras or see where to dig. 4. After finding the snake is extracted from the burrow and 5. It is taken to an open place where neutralized and put it in a bag. Effective regulation is needed for these activities, by establishing legal protection of both poisonous and harmless species, and that is actually implemented on the ground. Currently all non-venomous reptiles are protected, prohibited his arrest (Article 8, Decree No. 582-62 of November 3, 1962, BONS & GENIEZ 1996), this protection does not take effect in practice. In the Moroccan markets it´s very easy to find animals or their parts are exposed like any other item of legal sales. The main reason in the capture is the sale to the snake charmers or intermediaries, on the pretext of getting specimens to get venom for antivenom extract. The most feasible and practical alternative is the creation of farms where the reproduction of the species that can cause serious injury to humans, and thus have a stock of snakes that produce the poison necessary and also act as gene center of the most threatened. However folk resulting in Jemaa Lfna (Marrakech, Morocco) from charmers show, this should be prohibited by the damage caused in ecology by capturing of wild specimens and for the abuse that occurs to captive specimens. It is an anachronistic and unethical conduct, which the tourists should avoid not participating in the activity. 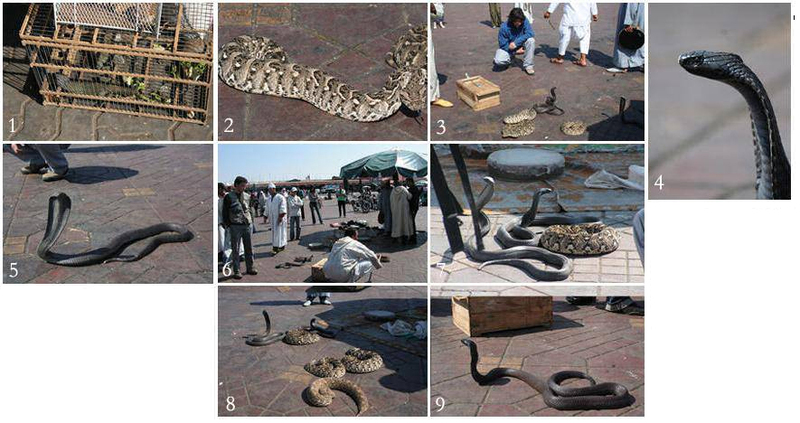 One of the major tourist attractions in many parts of Morocco is the "charm" of snakes. In 1985, Valverde felt that the major site of practice is Marrakech (84 charmers), followed by Ouarzazate (11), Taroudant (3), Agadir (3), Tangier (3) and Tetuan (2) (Feriche, not published). The problem is that this activity is extracted from natural samples and the treatment given to animals and the poor conditions they are kept. Currently there is a high social awareness of animal rights and the treatment we give them. Although the local population these concepts sound even distant and strange, it's not for tourists, who come from places where such displays would take decades longer banned and not accepted in its squares and markets. So why participate in this macabre spectacle in another country? As tourists continue to give a few coins in exchange for a false representation of charm and awful, or taking pictures with a non-poisonous species on the shoulders to impress friends and family around their exotic trip, this deplorable practice will continue. It is clear that awareness is still work to do in the tourist source countries. Jemaa Lfna Place (Marrakech) where you can see captive lizards (1), Puff Adders (2, 3, 7 y 8) and cobras (3-9). For the maintenance of the snakes, this leaves much to be desired. They are kept in overcrowded wooden or cloth bags, without food or light except in the case of cobras, the most rare and valuable. His state of stress, therefore, is continuous. In poisonous species, the teeth usually is removed. The charmers always deny it, as this detracts their show and courage. But sometimes you can see the specimens with swollen head by infection that has been caused by the amputation, and eventually die after a long agony. Another impact caused by this group is the plundering for sale to tourists. On occasion they have offered us various horned vipers (Cerastes cerastes) to take him alive as pets, so encourage the capture of a species that do not use them in their "work." The movement of the snakes may have also problems in the populations of the places that carry them. Thus, in shows in Tangier (Morocco), we have seen large specimens of Malpolon monspessulanus saharatlanticus, a different subspecies native to the area. If those speciemens are avoided or are released to be considered unsuitable for the shows, can lead to genetic contamination in the populations of the area in which this occurs. Or simply that move specimens to an area outside its natural range. Snake charmer in the surroundings of Ouarzazate (Morocco). 2010. Photo: © F. Javier Herrera Sanchez. The "pioneers" in the pursuit of an actual ban of these activities are GEOS association members, led by Michel Aymerich, which is ultimately to eliminate these shows: http://www.geos-nature.org/sign-the-petition.html. In this link we recommend to sign the petition and disseminate it to your contacts, to raise awareness on the subject. Also please visitors of this website that do not promote this activity in any way, paying for these shows, as in the opposite case we will be participating in this slaughter silent, and the process of extinction of two species that do not bear much mainly longer the excessive extraction of specimens that are submitted. Like all herpetologists know, probably the most unnatural wildlife death is found is on the road. In Morocco we have found on numerous occasions most of species in the road, living (few times) or killed (most times). The months in which abuses occur more often coincide with the mating season, during the warm rainy nights, for most amphibians and April-June for most reptiles and the time of birth and dispersal of juveniles (August-October). Also reptiles also use hot asphalt to get a warm temperature spending much time on the road. In some areas, black spots were found where there is a high death toll of one or more species in a short stretch of asphalt. These usually coincide with a nearby streams or rivers, rocky areas, slopes, near oasis in arid places, etc. The solution to this problem is hard. It is costly to implement the correct location and black points by barriers in places like Europe. In countries like Morocco, where the needs and priorities are now other, it is somewhat unlikely. Part of the problem would be solved based on awareness of drivers, whose trend is usually the opposite: If the animal is located, usually ignored, they tend to try to hit it, even modifying the vehicle's path. Barrier between a pond and the road. Hoyo de Manzanares (Madrid, Spain). Photo: © Gabri Mtnez. Cisterns, pools and pits act as pitfall traps for a large number of vertebrates and invertebrates. In most cases the animals die by drowning, by predation, starvation, dehydration ... Almost any animal is likely to fall and die in them so, placing stones and / or logs that help them to exit is always appropriate. Failing that, if the building is too high or large, stones to serve as shelter will enable survival (somewhat precarious in any case) to some of the victims. Example of animals found dead in cisterns in Morocco. 1. Varanus griseus. 2. Hemorrhois hippocrepis. Photo: © Gabri Mtnez. Reptiles and amphibians are hated by many cultures since ancient times. This area is not an exception. However, the economic and cultural development has helped us get to know these animals in much of the world and describe them as harmless animals to humans. However dozens of hoaxes and false stories go by word and frogs, geckos, chameleons, but especially snakes die when they encounter humans. Sometimes they are killed to be consumed by local populations (Genus Uromastyx, Varanus, Scincus ...), to be used as a talisman or a home remedy (Genus Uromastyx, Chamaeleo ...) and gifts (Testudo graeca shells, skins of Hemorrhois hippocrepis to make drums ...), but in most cases are killed by fear, pleasure or fun, and the children are who spend more time in hunting these animals (Bons & Geniez, 1996; Schleich et al., 1996). The only solution to this problem comes from the awareness and promotion of environmental education among the population, who know these animals. When out of ignorance and confusion that often occurs in people, it will mean a significant step in its conservation and animal evaluation as particularly beneficial and necessary and essential in the ecosystems in which they operate. One purpose of this website is just that, to make known the reality of these animals. It is true that there are snakes with a powerful poison in Morocco and that could kill humans, but as explained in each section, snakes are elusive animals that avoid contact with humans, and in case you tend to flee , attacking only when they have no another recourse. Accidents are rare and are caused by disruption to the snakes, either directly (when trying to capture or recklessly handle) or indirect (usually walking on a stationary animal and has not been previously). In a conversation with a family located in a rocky area with a high density of Moorish vipers (Daboia mauritanica) they confessed that they did not know anyone who had been bitten. 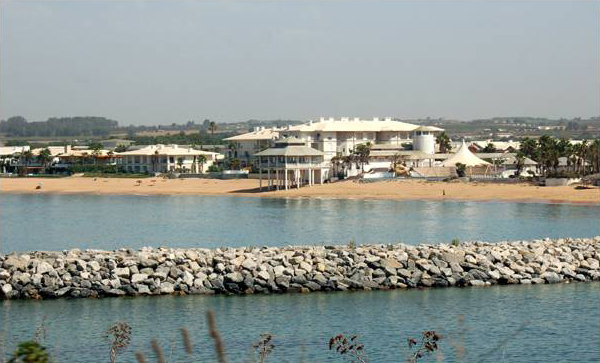 Urbanization on the outskirts of Casablanca (Morocco). Photo: © Gabri Mtnez. To which we must add other aspects such as habitat pollution, the deforestation and desertification (we will talk about this in the next point). This process of deforestation and cultivation of large areas continues apace. The best solution to this problem consists in the knowledge of the areas susceptible to changes in their habitat and the richest areas on herps in Morocco and Western Sahara. Once we know these, they should have some legal protection to ensure its immutability effectively. This seems the only way to stop the process of extinction of many populations of reptiles and amphibians are sensitive to habitat alteration. In the habitat destruction troubles we want to remark the trouble of the overgrazing, that affect to great part of Moroccan and Western Sahara territory. This occurs when the stocking density exceeds the regenerative capacity of vegetation cover in a given area. Overgrazing can be avoided if there are alternative food resources, which does not exist in Morocco, where in some regions you can watch the goats climbing trees to access food. In other cases, are the pastors who clear branches from the canopy to feed their cattle. Grazing has many consequences for natural ecosystems. Overgrazing thus affecting the growth, vigor and reproduction of plants, leading to changes in species composition, vegetation cover and the amount of biomass. This affects directly the herpetofauna in the case of vegetarian reptiles, such as Dobs (genus Uromastyx) or Spur-thighed Tortoises (Testudo graeca), among others, and indirectly for these and other species, as having less vegetation reduces the availability of shelter or food (insects and other invertebrates, birds, rodents). To this we must add the continuous trampling of livestock reduces bulk density and soil infiltration rate, thus increasing the surface flow and thus causing desertification of the land. This happens in much of the Moroccan territory. It´s important to develop plans for prevention and optimization, to minimize the negative impacts associated overgrazing. The political organs of the arid areas in particular, must seek a sustainable development for economically disadvantaged regions of Morocco, trying to join the interests of rural people with the conservation of ecosystems. Otherwise, continue to increase the process of desertification which leads to reduced densities of fauna and increasing poverty in general. Feriche, M., Pleguezuelos Gómez, J.M., Martínez Silvestre A., Soler Massana J., Fahd S. 2007. Los Aissauas o encantadores de serpientes de Marruecos. Reptilia, 66: 42-46. Taiqui, L. 1997. La dégradation écologique au Rif marocain: nécessilés d'une nouvelle approche. Mediterraea 16: 5-17.